How to Set Up Grow Tent Ventilation? The grow tent allows you to grow plants indoors and one of the key aspects that should be of concern is the atmosphere. You would not want to have your plants suffering from too much heat or humidity. The only way to control this is through proper ventilation so as to keep the indoor growing tent cool. On this guide, I will show you how to set up a grow tent ventilation, which ensures that the plants get the right amount of heat, humidity and carbon dioxide among others. However, I think it would be imperative to understand the essence of ventilation in the tent. What Is the Importance of Growing Tent Ventilation? When you have lights, they will emit heat and this can alter the temperature inside the grow tent. With ventilation in the tent, you will be able to get rid of the excess heat that may be detrimental to the plants. If the humidity is not controlled, then it means that your plants may not grow in a healthy manner. Ordinarily, plants will produce water vapor, which increases humidity. The ventilation system will control the humidity. Any grower is worried about pests and diseases affecting their plants. When you have proper air circulation, you will not have to worry over such. CO2 is one of the key ingredients to proper plant growth. The plants that grow outside access carbon dioxide naturally. However, in the grow tent, the levels of CO2 keep decreasing. The ventilation will bring more carbon dioxide from the outside. The plants that grow outside have their stems strengthened by virtue of being with the stand strong winds. The air that is blown by the ventilation system will help the plants inside the tent to stabilize their stems. The process of setting up a tent is not usually cheap. However, when you get it right, you can be able to grow any crops at any time. As you have seen, there are many benefits that you will enjoy with an indoor plant growing tent that has proper ventilation. 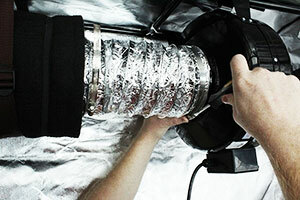 So let’s get right into the process of setting up the ventilation inside the grow tent. How to Ventilate Your Grow Room? Ideally, the essential bit of the ventilation system is having the fans and the carbon filter working for you inside the grow tent. You need to have proper ducting to connect the filter and the fans together. Essentially, when you have the fans working properly, you will control the air flow and circulation. Here are some details that would be ideal. The oscillating fans are cheap and quite effective. They are known to constantly blow air all around the plants and this will improve the air circulation in the tent. The setup process of oscillating fans is quite easy and they give you enough room to maintain your plants. When setting up the oscillating fans, you will need to have a number of them, depending on the size of the grow tent. When hanging the fan, ensure that they are not directly on your plants to avoid windburn, which can cause serious damage to the plants. The air extractor is used in the ventilation system as it will take out the oil air and bring in the fresh air. You should hang the extractor fan on the crossbar and ensure that it runs once in every 5 minutes, as this is the only way to make sure you have proper air circulation inside the tent. The best way to have the ventilation set up is when you are setting up the grow tent. You need to check the manufacturer’s instructions as far as the setup of the growing tent goes. The reason why you should set up the ventilation during the grow tent assembly is to prevent any cases of interfering with the plants. You can be able to bring in the air into the grow tent through two ways; either passive or active intake. 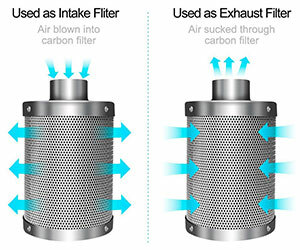 The passive intake will rely on the negative pressure and passive airflow. This allows you to blow air out but there will be no fan that blows air inside. You will need to create a hole that will allows air to get into the tent passively. If you choose to use the passive intake system, you should have a hole that is about 4 times larger than the exhaust hole. 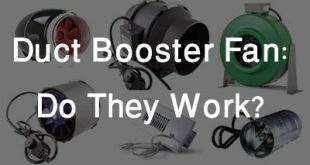 This will enhance the effectiveness of the fan and prevent it from overworking. Ultimately, this will give your ventilation great suction. As the name implies, the active intake system will draw air from the fan directly. This means that there is one fan that blows air in and another one that blows air out of the grow tent. In this case, the size of the intake hole does not really matter. The other bit of ventilation set up in the tent is to be able to control humidity. You will want to find a ventilation system that will control the humidity levels so as to prevent diseases. The process of lowering humidity levels is quite simple as you will just need to push the humid air out using the exhaust fan. 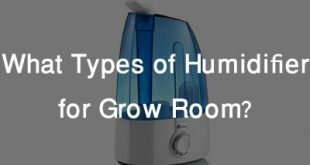 The dehumidifier is also another accessory that you can choose to have inside the grow tent. 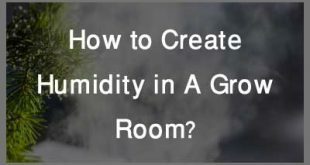 There are other instances when you may be forced to increase the humidity levels. This can be done by sealing off the grow tent and switching off the exhaust fan. However, before doing this, you should have proper research so as to determine the amount of humidity that is favorable for your plants. Larger plants will produce more water vapor and as such, they may have to keep an eye on the humidity levels more often. The final aspect that I will look at, as far as the setup of the ventilation goes, is the injection of carbon dioxide. This is an essential element for transpiration to take place. However, unlike, the plants on the outside farms, CO2 levels in growing tents seem to be too low and this is why you may have to inject it. Proper injection of carbon dioxide requires that the tent is sealed completely. This will help in attaining efficiency as you will notice that co2 will only be used when it is highly concentrated. Sealing up the grow tent completely will help in increasing the concentration levels of carbon dioxide. Secondly, you need to seal off the tent for safety reasons. You would not want to have the CO2 to leak into your home as this can harm your loved ones. 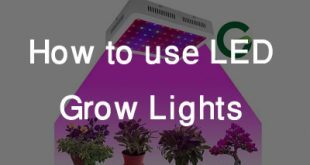 Have bright grow lights when you are injecting carbon into your grow tent so that the plants can maximize the on the CO2. Read this Article to know more about How To Assemble A Grow Tent Kit? The process of setting up proper ventilation may sound quite complicated. However as long as you can understand the different aspects of ventilation as highlighted above, you should not have too much difficulty. There are so many benefits that are associated with a good ventilation system in your grow tent. You need to find all the essential accessories to help you with the ventilation system. The carbon filter, fans and ducting are the key components that you will need when setting up the ventilation. You should never compromise on the quality of the accessories that you will have inside the grow tent. You need to be keen on the strength of the fan and the filters that you have so that you can create a conducive environment for the plants to thrive in. 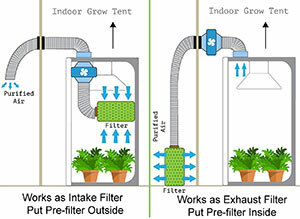 If you found this guide useful, please feel free to share it around with others, so that they can learn how to set up hydroponic tent ventilation.